Once in a land close by lived a bunny. Not a bunny by ordinary standards! For she is Flora McBunny. Flora likes to go on adventures and is never happier than when climbing trees. Trees that will help her hide out and surprise her owner or a place to whisper all their secrets to each other away from others ears. Flora is that type of bunny. The type to cuddle and comfort in bed at night after a day full of adventures. The type to hang out with and become a little girls friend. Flora is made from Rico cotton and was so much fun to make. She was at times fiddly to put together but for a first attempt at a toy I’m extremely pleased with her and how she turned out. Flora was named after the lovely flower that adorns her. She was hooked from the wonderful pattern of Spring Bunny by Josephine Wu. 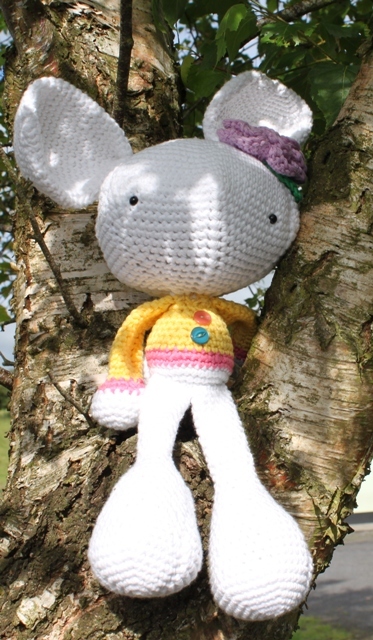 I am now working on other Flora McBunny’s including a boy version. Stay tuned for more adventures…. 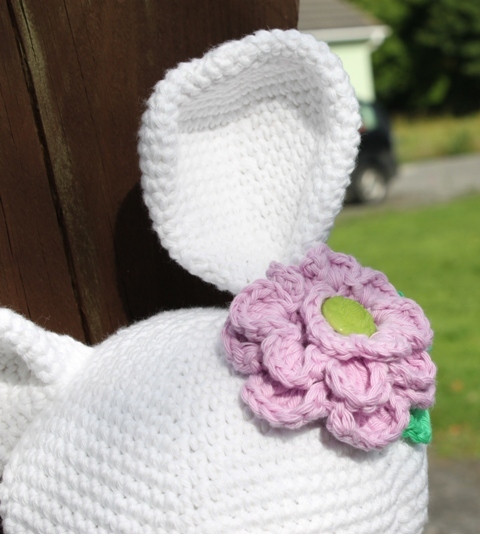 This entry was posted in Crochet, Finished object and tagged Flora, Flora McBunny, Spring Bunny. Bookmark the permalink. 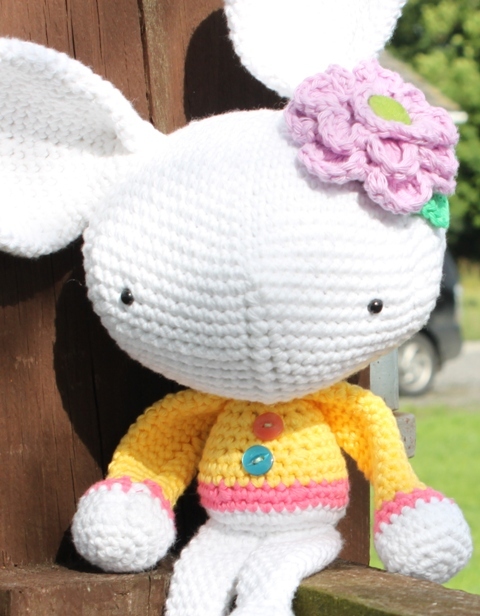 I love Flora McBunny, she’s gorgeous and I’m sure she will become your little one’s fave toy. I’ve added knitted toys to my YOP list, just hope I can do as good a job as you Ruth. She is adorable. Great job! Sweeeeeet! Can’t believe it is your first toy! Flora Bunny is adorable Ruth. I just knew it……………………I fell in love with her as soon as I saw her picture. She is fantastic and you did a great job on her. I am sure Lady Evelyn will be in love with her too. Flora is amazing, i love her! The feet and ears just make her! This bunny miss is fantastic! She is so cute. I love her photo shoot. What beautiful land you’re surrounded with. Thank you, you sure would love it here so as that surrounds most of my house. I love it and love the area and its beauty.